Up until about 20 seconds ago, I didn't know how Dean DeBlois. Now I know he's written and directed two big time animated movies that combined have grossed over $1 Billion dollars worldwide. 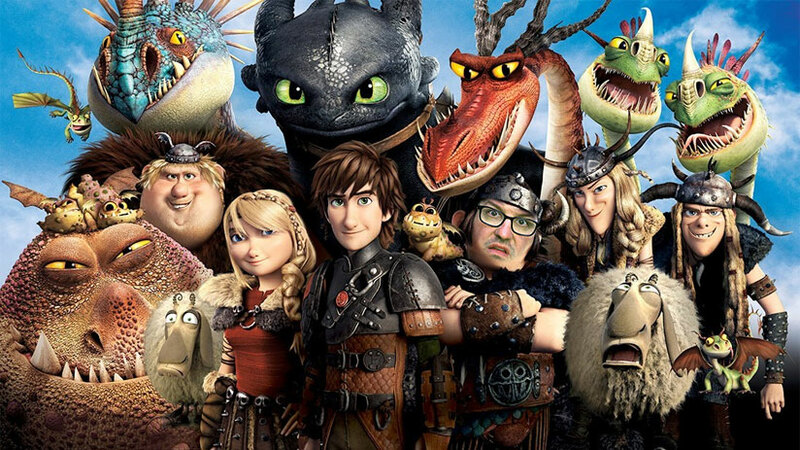 It was literally one year ago yesterday that I watched the original How to Train Your Dragon, and tonight I just finished today's FNE Movie Month feature, 2014's How to Train Your Dragon 2. What can I possibly say that could add to this movie? Nothing really. I loved it. I knew I would. I loved the first one. It took me three years to finally watch that one. This one I got to in only one year. Who knows, maybe when the third installment comes out I'll actually see it in the theaters. Keeping with the "4 years in between movies" we'll find out in 2018. For me, the wait was only one year in between seeing these characters again, and it was like catching up with old friends. Maybe it's me, but that's how I see characters in books, shows, or movies. Not literally as "friends" (I still have some grasp on reality - by the way is anybody going to Arnold's later? I heard the Fonz is jumping over a bunch of barrels in the parking lot) - it's more really just seeing something you enjoy and are familiar with - you love seeing it again. At the end of the first movie, dragons and man have put their pasts behind them and have joined in peace and friendship. This time around those are both challenged by a villian who sees and uses dragons as weapons. Along the way, we learn a little more about our characters. We have moments to cheer, and moments to cry. I have a distinct memory of watching television in my grandparents house. They had an old TV in their finished basement that was in a wooden cabinet that sat on the floor. I was on their exercise bike (that should be the most shocking part of this story) watching a cartoon. In the cartoon a dog was lost and started to cry. And I started to cry. It was at that point I realized I'm a bit of a softy when it comes even the slightest emotional moments. To this day I cry like a fool during the final montage of the final Happy Days (Seriously though, we gotta make sure to catch that Fonzie jump. I can't imagine he'll ever jump anything more memorable than a row of barrels). So here I am watching an animated movie about vikings and dragons, an there are moments where I get chills. There are moments when I feel joy. There are moments when I almost cry (I always carry a knife and an onion as a cover story). Maybe that makes me in touch with my emotions - or maybe I'm just a sucker for these movie tricks. Either way, whatever it was the movie was hoping to attempt, it did so successfully with me. I almost said that I didn't realize these movies were based on a book series. Turns out I knew that last year and just forgot. But I still do want to go and read all the children's books these movies were based on. This may be a bit of a spoiler, so SPOILER ALERT, but I was originally going to say - if Hiccup didn't go exploring, none of this would have happened and his father would most likely still be alive. But Hiccup would have never met his mother, and she and his father would have never reunited even for that brief time. And any dragons that were trapped were freed. So I guess it was worth it. Not sure if I have any other animated films on the horizon, but animated or not this was one of my favorite movies of the 10 I've watched so far. And already I'm 1/3 of the way finished. 10 down. 20 to go.